MobileMonday Tel Aviv: fring is a finalist at Mobile Peer Awards! fring is a finalist at Mobile Peer Awards! Thanks for all who came to our event yesterday. As announced, fring, the startup we chose at our MoMoTLV Peer Awards event, was chosen as one of 20 finalists that will pitch in the Mobile Peer Awards in Barcelona. This is the first year we are participating in this prestigious contest, and the startup we sent got nominated as a finalist, so these are great news for MoMoTLV and the Israeli mobile industry (See the full finalists list here). Those of you who are attending the MWC (3GSM), please register to the Mobile Peer Awards event and come to show your support. The event will be held on Monday, Feb. 16 in Barcelona at the Petit Palau at the Palau de la Musica (Note that this is off-site from 3GSM/MWC) starting at 4pm and ending at 8pm. You'll get to hear presentations from 20 startups as well as high-profile keynotes, network with other MoMo-ers from around the world and eventually find out first who are the winners, and even vote for the audience award! Also, as announced yesterday, we are making a list (with your help!) of everyone who will be in Barcelona for the conference, so that you can see who else is coming and so that we can communicate with you in Barcelona regarding events and parties. We'll also publish the list in several chapters discussion groups so that they know who's coming and network with you. So if you're coming - add yourself to the list. See you in Barcelona, and good luck to Fring! 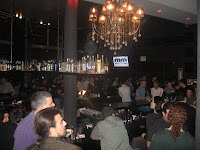 MoMoTLV first 2009 event is here!